A sloppy final quarter saw Hawke’s Bay record their first loss in the National Basketball League tonight. “We became very stagnant,” Taylor Hawks head coach Zico Coronel said after his team’s 93-85 loss to Cigna Saints in Wellington’s TSB Stadium. Prewster played for the Nelson Giants last year and will take on his former team for the first time at Taradale’s Pettigrew-Green Arena tomorrow night. Once again plenty will be asked of Kenny on defence when he marks Kyle Adnam who had a career best 32 points against the Sharks last week. Coronel said there were no major injury concerns in the Hawks camp in the countdown to tomorrow night’s clash. Quiz Hawkes’ Bay basketball team captain Jarrod Kenny on the last time his team beat Saints in the capital and he struggles. “I can’t remember. 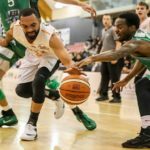 There’s been a lot of games since then and I know Wellington is a tough place to win at,” Kenny said shortly after the Taylor Hawks arrived in Wellington last night to prepare for tonight’s Sal’s National Bsketball League third round clash against Cigna Saints in the TSB Bank Arena. It was 2011. The Hawks won 100-99 and Kenny, a ninth-season Hawk is the only member of tonight’s squad who was in that winning team. Hawks fans will be pleased to know Kenny, 32, has left the history side of tonight’s assignment alone and focused on the now as he will be marking in-form fellow Tall Blacks point guard Shea Ili who is averaging 29 points and 8.5 assists per game. “Shea is having a great season. They are asking a lot of him and he is producing. He is going to be tough to stop,” Kenny said. Former Perth Wildcats player Kenny who will link up with the Cairns Taipans when the next ANBL season begins said three consecutive wins to date have his team in the right frame of mind. Tonight’s match will be the Hawks third consecutive one on the road before returning home to host the Mike Pero Nelson Giants tomorrow night. Kenny, who has averaged 11 points and four assists a game, agreed it won’t get an easier for him as he will mark last weekend’s player of the week in Kyle Adnam. Another key match up tonight will see Hawks shooting guard Dion Prewster go head to head with Saints import LJ Peak who is averaging 21.5 points per game despite being plagued with foul trouble. Saints are averaging 108 points per game but are also allowing their opponents to score 102. The Hawks have been much better defensively with their opponents averaging 82 points at 43 per cent overall and 27 per cent from the three point mark. Like the Hawks, Kenny’s former Giants outfit, could also arrived at the Pettigrew-Green Arena with an unbeaten record if they beat Taranaki tonight. Adnam had a career best 32 points against the Sharks last week and will provide a stern test for the Hawks defensive systems. It will be interesting to see how the Giants treat their former teammate Prewster. He is averaging 18.3 points per game, five more than what he averaged with the Giants. Hawks head coach Zico Coronel agreed his inside knowledge of the Saints stable gained during his assistant coach role in the capital will assist him tonight. Coronel pointed out his troops will need to play “significantly better” than they did in last weekend’s wins against Palmerston North and Taranaki to beat Saints. Coronel was pleased to report he has an injury-free roster to work with tonight. 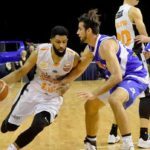 The Sal’s NBL had two thrilling encounters with the Giants remaining unbeaten with 93-90 win over the Augusta Airs, and the Cigna Saints beating the Taylor Hawks 93-85. 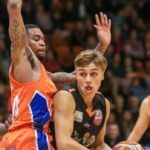 Tonight, the Giants had to get the win without star forward, Finn Delany, but after a couple of quiet outings, Tohi Smith-Milner, had a season high 27 points on 11/16 shooting. Kyle Adnam backed up his player of the week effort last week with 20 points, 10 assists, seven rebounds and four steals for the Giants who are now at the top of the table with a 3-0 record. It was another tough loss for the Airs, who have now lost back to back games by three points. Javonte Douglas had 20 points and nine rebounds, and fellow Roger Woods added 17. The fourth quarter was a tight one, both teams would share the lead, but a bucket from Smith-Milner, and two free throws from Adnam gave the visitors a three point lead in the closing seconds. Alonzo Burton was unable to convert on the potentially tying three pointer. Taranaki drop to 1-2, but will have a chance on Sunday to get back on the winners board when they host the 2 Cheap Cars Supercity Rangers. 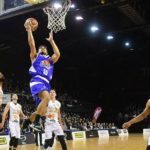 The Wellington Saints have had to fight back from a nine point third quarter deficit to claim their second win of the season, giving the Hawks their first loss after three straight wins. Shea Ili had another strong outing with 26 points, LJ Peak had 21 and off the bench Shaun Bruce added 18 for the Saints who outscored the Hawks 28-15 in the fourth quarter. It looked like the Hawks might come away with the win when forward Jamie Skeen took over the game with three straight three’s in the third quarter. Skeen was a tough cover for the Saints tonight as he would out-muscle his opponents from the inside and stretch the floor from the outside. Skeen ended the game with a game high 29 points. Jarrod Kenny would have 17 and Angus Brandt had 16. The Hawks will return home in the hopes of giving the Giants their first loss of the season tomorrow and return to the top of the table. Article originally published on NBL NZ. The Taylor Hawks have made it three from three with a thrilling 90-87 win over the Augusta Airs. Dion Prewster (25 points) and Angus Brandt (23 points) and have led the way for the Hawks who are now only one win away from tying last years tally of four wins. The Hawks were coming off the second night of a back to back and they had to dig deep after trailing by as many as 15 in the third quarter. But in the third the Hawks went on a 10-2 run which was led by Prewster and Brandt, forcing the Airs to call a time out. But the timeout would not prevent what was a strong finish to the period for the Hawks who would outscore Taranaki 26-16. In the fourth, the Hawks widened the gap to eight, but a mini run by the Airs saw them close tie the ball game with two minutes to go. Brandt would reply with a three point play to put them ahead 88-85. The Airs had a couple of three point attempts to tie the game but they were unable to convert. After the second Airs missed three point attempt, they managed to get stops, but two offensive rebounds from the Hawks allowed them to milk the clock to 10 seconds, forcing the Airs to foul Prewster. Prewster would convert on both attempts to make it a two possession ball game. A Dane Brooks two pointer did get the Airs to within three with 3 seconds left, but time would not be on their side as they were unable to secure another possession. Taranaki were led by Javonte Douglas who again impressed with game high 30 points, but was on track to go for forty plus after scoring 22 by halftime. Alonzo Burton added 14 points, seven rebounds and seven assists, and Xavier Smith had 13 points. In Christchurch, the SIT Zerofees Sharks have won their second straight with a cruisy 108-95 win over the Wheeler Motor Canterbury Rams. Small forward, Orlando Coleman, grabbed 24 points and 13 rebounds, and Alex Pledger also had a double-double of 14 points and 12 rebounds for Southland who move to 2-1 on the road. Coleman had a chippy battle with Rams Winston Shepard who finished the game with a team high 26 points. Canterbury trailed by nine after the first period, but did fight back to only be down four at halftime. But in the third, the Sharks had their highest scoring quarter, outscoring the home side 35-19. Southland would push their lead to as many as 26, before a spirited fight back from the Rams made the final score semi-respectable. Tonight, the Rams had no answer in particular to the size of Pledger and athleticism of Coleman, overall the Sharks dominated the boards, winning the battle 54-38. Southland were balanced offensively with all five starters reaching double-digit or more points with the added bonus of 29 bench points. Rams point guard Xavier Thames added 23 points, Julian Washburn scored 19, and the other notable effort was from young point guard Taylor Britt (nine points) who gave high energy on both ends of the floor. Southland will now have another stern challenge tomorrow when they play the in form Mike Pero Nelson Giants. Originally published at NBL NZ. The Hawks’ resurrection continued as they scraped home by the skin of their teeth and one could see why in the arm wrestle that unfolded in the second and third quarters in New Plymouth last night. 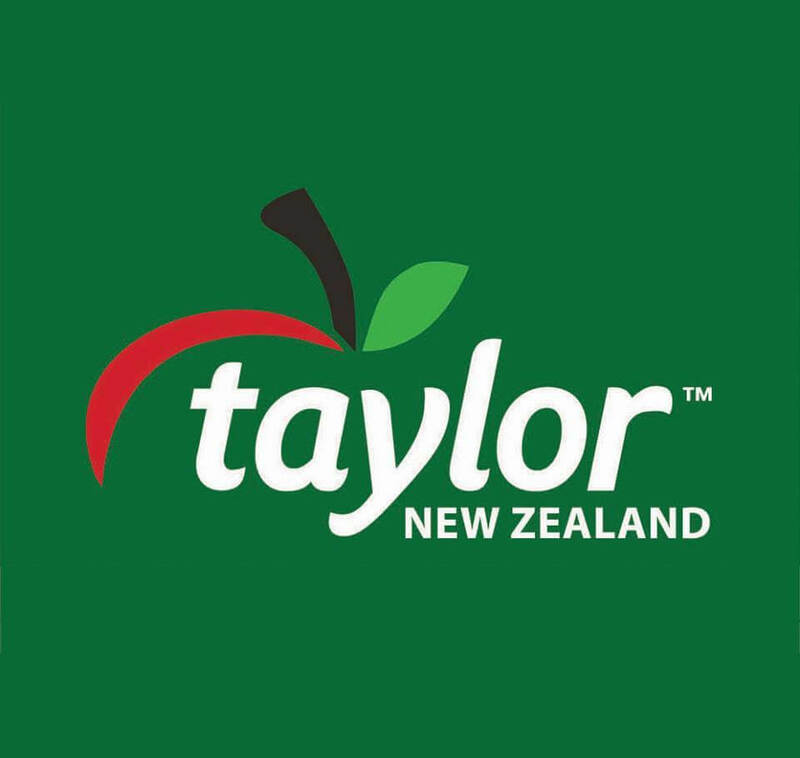 Little separated the Taylor Corporation-sponsored Hawke’s Bay franchise team from the Augusta Taranaki Mountainairs in the first and final quarters as the visitors edged out the hosts 90-87 in the round-two match of the Sal’s National Basketball League at the TSB Stadium. “Basketball. I mean you’ve seen enough games to know that there are some games you’re going to win with a big scoring margin and then there’s going to be those that’ll come down to the wire, so this one was one that came down to the wire,” Hawks coach Zico Coronel said last night after the Airs made their move in the second spell, 29-19, before the Jarrod Kenny-captained Hawks returned with a don’t-argue 22-16 in the third. When push comes to shove the big men, in particular, come to the fore. 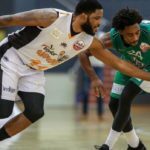 Airs import Javonte Douglas couldn’t follow up with a double-double but did claim a game-high 30 points, while ex-Hawk guard and captain Alonzo Burton scored 14 points and took seven rebounds as well as many assists. That double-double honour belonged to the Hawks’ Australian import centre, Angus Brandt, who nailed 23 points and 14 rebounds, although swingman Dion Prewster claimed a team-high 25 points and seven rebounds to boot. Kenny chimed in with 14 points and five assists. Coronel praised the Trent Adam-coached Airs for their preparation and discipline to adhere to the game plan. “They turned the ball over only four times in the whole game. They won the possession game and had more opportunities than us,” he said after the Hawks found themselves adrift by as many as 15 points going into the third spell. That spurred Prewster and Brandt into spearheading the Hawks into a 10-2 run, prompting Adam and assistant David Bublitz to call a time out, to no avail. The final spell see-sawed with the Airs tempted to chance their arms from the carpark but they found no love from the rim. However, Coronel said the Airs upped the physicality stakes in an attempt to disrupt the Hawks’ timing and had had considerable success in doing that. He said Douglas was “phenomenal” in the first half, surging to become a 22-point stakeholder in the Mountainairs’ 49 points. Coronel felt it was a collective effort to put up the storm shutters on Douglas who would be the pick of imports for the Airs this season. “They [Hawks] ran a lot of action as a team and utilised the shot clock to the maximum so you’re going to get the match ups and the help and switches but it will never be anyone personally, especially against Taranaki and the way that they play,” he said when asked on who had the portfolio to do the job on Douglas. Coronel said what was different in the second quarter was the Airs’ defence which saw his men rush their passes to players who had open looks at the rims but perhaps a better ploy should have been generating better angles to shoot from. In the third, the Hawks had turned on their intensity, something he had impressed in the changing rooms at halftime on playing closer to their capabilities. A rash of stops also saw the Hawks claw their way back from 56-41 to trailing 58-57 for a better sniff at eking out victory. The Hawks’ higher shooting statistics, he felt, was on account of their physical assault on the interior who exploited points from certain positions. He also reflected on the 32 fouls shots from the charity line, which Brandt, US import Jamie Skeen and Prewster, with his triple penetration, milked to the hilt. Coronel was happy with his men’s rebounding in the second half but felt the Mountainairs’ “long and skinny people” had attacked the boards quite aggressively to claim advantage in the first half. 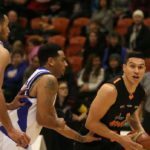 “It’s great for us to come on the road to get two wins,” he said but emphasised next week they had defending champions Wellington Saints on the road on Friday before returning home to host Mike Pero Nelson Giants at the Pettigrew-Green Arena, Taradale, on Saturday night. Coronel said it was good the Hawks had shown some character tonight to fight their way out of a hole. In Christchurch, the SIT Zerofees Southland Sharks, who lost to the Hawks in the opening round in Napier, tonight won their second game in a row with a 108-95 result over the Wheeler Motor Canterbury Rams. The Sharks play the Giants at Trafalgar Centre, Nelson, tomorrow night. ■ Result: Airs 87 (Javonte Douglas 30pts, 5 reb, 4 asts: Alonzo Burton 14pts, 7 reb, 7 asts; Xavier Smith 13pts, 1 block; Dane Brooks 11pts, 5 reb; Roger Woods 11pts) Hawks 90 (Dion Prewster 25pts, 7 reb: Angus Brandt 23pts, 14 reb, 5 asts, 1 block; Jarrod Kenny 14pts, 5 asts). Quarters (Airs first): 1st, 20-19; 2nd, 49-38 (29-19); 3rd, 65-60 (16-22); 4th, 87-90 (22-23). When basketball import Jamie Skeen boarded his flight in Charlottesville he was prepared to miss out on celebrating his birthday on May 2 simply because of the time difference between the United States and New Zealand. Well, actually, missing the Jets wasn’t on a keen Skeen’s agenda either, for that matter. As it turned out, he had missed his connecting flight from Houston, arriving at Auckland airport after the 20-hour-plus haul only to find his baggage had gone astray before making his debut for the Taylor Corporation Hawks. 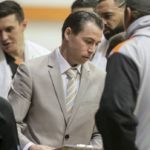 Hawke’s Bay franchise general manager Kevin Wagg said the 30-year-old power forward had departed on a plane from Charlottesville on a two-hour journey to Houston but his baggage was not transferred to his connecting flight, NZ29. “So he arrived in Auckland with no bags. He was hanging around the old, bloody carousel and no bags turned up. You see, Skeen had arrived in time for the Ballroom Arena Manawatu showdown but did he have the appropriate footwear to make the right moves he has become renowned for? They weren’t just any boots but a pair of mammoth size 16s. “They aren’t available anywhere in New Zealand and they were in his luggage,” explained Wagg soon after arriving in Palmerston North for the 7pm tip off against Go Media Jets in the round two Sal’s National Basketball League match last night. “He had his priorities right. He had his X-Box but not his important footwear,” he said with a laugh, after the 2.03m player joined the Zico Coronel-coached Hawks as their third overseas signing and got precious 12:20 minutes on court. The others are Australian bigs Angus Brandt (2.08m centre) and Oscar Forman (2.06m power forward). However, Air New Zealand averted disaster when it came to the rescue of Skeen who had arrived in Napier at 9.30am on Wednesday. The national carrier got his bag to Palmerston North airport where the Hawks team bus, with Skeen, collected his luggage about midday. Surely former US import Kareem Johnson, who became a naturalised Kiwi late last month, must be flirting with size 16 feet? “No, Kareem’s only size 15,” said an exhausted Wagg who had spent more than two hours phoning just about every major sports retail outlet in the country to buy a size 16 pair before Air NZ’s gesture. Skeen, he said, couldn’t rock up to a shop to buy a pair but had to order them in advance. The nervous player also had to go shopping for some clothes on Wednesday. “I took him to the Warehouse to buy some gruts. He thought we were going out to get some food and didn’t realise it was underwear,” said Wagg, revealing Skeen had sent a text to his girlfriend in North Carolina shortly before of the excitement of tasting some Kiwi tucker. For the record, Skeen had celebrated his birthday with family and friends on March 30 and the Hawks whanau welcomed him to the Bay with a celebratory dinner. A strong first quarter from the Taylor Hawks have secured their second win of the season with a 89-74 win over the Go Media Jets. The visitors came out and executed from the beginning, outscoring the Jets 27-10 in the opening period. Ethan Rusbatch scored a team high 16 points, and off the bench Mitch Newton added 15. Manawatu did show glimpses throughout the next three quarters, and ended up outscoring the Hawks 29-24 in the final period. Point guard Daishon Knight led the way with 22 points, Kuran Iverson had 18, and Brandon Lucas added 14. Much the same as last week, the Jets struggled from the field, shooting 38%, and often were settling for the three in which they shot a poor 6/30 (20%). 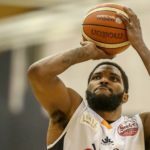 The Hawks added new import Jamie Skeen to the line-up tonight, and the American forward immediately made an impact, hitting a three on his first touch. Skeen, who went to college at Virginia Commonwealth University, played only 12 minutes, scoring nine points. Hawks head coach, Zico Coronel, was able to rotate his squad, keeping the majority of his starters under 20 minutes which could be crucial to potentially claiming a third straight win when they play the Augusta Airs tomorrow night. 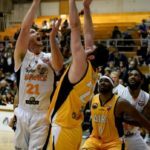 Manawatu will have a unique road double-header playing in Invercargill against the SIT Zerofees Sharks next Thursday, and then two days later will be at the opposite end of the country to play the 2 Cheap Cars Supercity Rangers. Hawks coach Zico Coronel says his troops always believed they could beat the Southland Sharks in the opening round in Napier last week. Coronel says both teams had quality on paper after the Gold Coast Commonwealth Games, although the Taylor Corp Hawks were in a better position to exploit the Sharks’ weaknesses rather than vice versa. He says Tim McTamney, Coronel’s mentor and good friend from the time he started coaching, is doing a great job with an “extremely young” Go Media Jets. 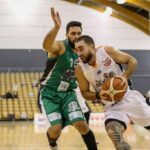 “They are playing multiple people who are still at high school,” he says of the Jets, who lost 95-69 to the Taranaki Mountainairs in their opening round last week. Coronel says the Jets generated some good ball during the Blitz but sharper shooting would have helped their cause. Aggressiveness and confidence, he feels, makes them dangerous. Their imports arrived late but should be better polished for the round two 7pm match at the Ballroom Arena, Palmerston North, today. Hawks Aussie import Oscar Forman, who retired from the ANBL, caught Coronel’s eye in a 3 x 3 tourney across the ditch so when the franchise contacted him he was keen to play here. Coronel says Forman is a good talker and a premier shooter in Australasia who will find his groove after a few more games. He played 28 minutes in the first game. The 36-year-old power forward from Adelaide, he says, was instrumental in drawing attention from the Sharks after two shots at the basket, which, in turn, freed up shooting guard Everard Bartlett to find the rim. “With Oscar, I guess, we’re looking through his long-term situation,” he says. Coronel says the double header on the road from today will be an opportune time for his players to strengthen their bonds to find resilience, considering they had excellent support from the fans at the Pettigrew-Green Arena in Napier last Thursday. He says if the Hawks keep giving the PG Arena faithful reasons to return they can grow the fan base to the halcyon days. Sometimes a result is so painfully obvious in just the first quarter of a basketball game that it becomes pointless trying to drive home any other messages. That pretty much sums up the Taylor Corporation Hawks’ comfortable 89-79 victory over Go Media Manawatu Jets in Palmerston North tonight. “We got off to a good start, we executed and played well as a team and the result was probably never in doubt from the end of the first quarter,” was the verdict of Hawks coach Zico Coronel after the visitors posted an emphatic first deposit of 27-10 in the first 15 minutes of the round two Sal’s National Basketball League encounter at Ballroom Arena Manawatu. Coronel labelled the second spell, 47-28 (20-18), as “sloppy” from the Jarrod Kenny-skippered Hawks but lauded his young charges for coming on to maintain the lead into the final two quarters — 65-45 (18-17) and 89-74 (24-29). Gold Coast Commonwealth Games bronze medal-winning Tall Black Ethan Rusbatch claimed a team-high 16 points while fellow Hawks newbie Mitchell Newton scored 15 and Hyrum Harris contributed 12 to the collective cause. For the hosts, point guard Daishon Knight had a game-high 22 points, Kuran Iverson scored 18 and Brandon Lucas added 14. That the Jets struggled from the field was a testimony to the Hawks’ defence, forcing the hosts to chance their arm from outside the arc with dismal returns of six from 30 (20 per cent). The Hawks’ depth was reflected in their bench which mustered 52 points compared with the Jets’ 13 but Coronel was mindful of inflation creeping into the match so he injected 11 of his 12 players in the first quarter. “I guess for the best part of the back-to-back [presence] no one played over 21 minutes, I believe, so I believe everyone’s well rested,” he said. The Hawks travel to New Plymouth where they’ll tip off against the Augusta Taranaki Mountainairs at 7pm tomorrow in their first double header on the road. They are expecting a sterner test from the Airs who are playing their first game at home this season after a 95-69 opening win over the Jets last Sunday. US import forward Javonte Douglas claimed the first player of the round with a double-double 28 points and 20 rebounds. The Hawks, he said, weren’t preoccupied with “style points” but doing what’s appropriate for the season. However, Coronel tonight injected his third import, American Jamie Skeen, who sunk a three-pointer on his first touch. Skeen, who went to college at Virginia Commonwealth University, played only 12:20 minutes, scoring nine points. Coronel said they swooped on him after his team in Finland had been eliminated in the playoffs. “He’s played in the top league in Israel, where Corey Webster’s playing, and he was very productive in the league in Italy,” he said of Skeen who has trained with the Charlotte Hornets. “He’s a very honest bloke, very humble and almost like a Kiwi so he fits in really well and a very clever basketball player,” he said, revealing the import had pointed out something pretty subtle to Mitchell Newton during training this morning. Hyrum Harris is embarking on his first year as a professional but you would never guess that watching the way he operates on the basketball court. That’s because Harris belongs to the sought-after species of players who leave nothing in the tank when asked to perform myriad duties during the Sal’s National Basketball League (NBL). “I tried to go back to [American] college but I couldn’t pick up any offers,” says the 21-year-old from Hamilton who is making his debut with the Taylor Corporation Hawks this season. The Hawke’s Bay franchise team play their first double header with a 7pm tip off against Go Media Jets at Ballroom Arena Manawatu today and then reload against Augusta Taranaki Mountainairs at the same time at the TSB Stadium, New Plymouth, tomorrow. He considers “hustling” as his most sound attribute, with passing not far off, but shooting isn’t his forte just yet. He is just happy the Hawks chalked up a win first up, 92-84, against SIT Zerofees Southland Sharks in the NBL opener last Thursday but feels they still have a lot to work on individually and collectively. Under the tutelage of Hawks coach Zico Coronel he appreciates he has just as good an opportunity as anyone else to show his prowess. He had got on the court for 16 minutes, eking out six points and seven rebounds, including four defensive ones at the Pettigrew-Green Arena last Thursday. Embracing the impending challenges in the NBL this winter is high on his agenda and the marquee teams will become the litmus test for him. Keen on playing basketball in the key, Harris wants to sharpen up his lay-up skills. The Hawks found lots of love from the rim, sinking 13 times from outside the arc. While Australian import centre Angus Brandt was fouled out within 15 minutes in the much-anticipated face-off with Sharks counterpart Alex Pledger, he should make the most of the match up against a young Callum McRae tonight. The Jets, returning after a two-season hiatus, have had the wood on the Hawks in five of the previous six outings but it’ll be an upset of gargantuan odds if they prevail tonight. The Airs’ first home game tomorrow, of course, will be a slightly sterner test considering they boast a similar record to the Jets against the visitors. Harris is coming off a three-season stint with the 2 Cheap Cars Supercity Rangers but has no qualms about coming out of his comfort zone. “I just wanted a change to see what I was like on my own,” says the swingman, who works part-time at William Colenso College as a teacher aide. Coronel and his maternal uncle, Kazlo Evans, of Hamilton, are friends so Harris’ name cropped up after the under-23 national tourney and the rest is history. Apart from the lifestyle changes from the Big Smoke to here, Harris says the likes of forward Dillon Boucher and versatile guard Dylan Tait boasted heaps of experience with the Rangers. Coronel says Harris was one of the standout players at the pre-season Blitz in Palmy North a fortnight ago for someone who picked up an injury last season with the Rangers after three games and then didn’t really find his way back into coach Jeff Green’s rotation. Harris can perform the role of a point guard and hustle but Coronel feels he is more pronounced as a No 4. However, the player emphasises by no means are the Hawks going to look through them tonight. His parents, Allies Evans and Reuben Harris, have supported him since he found traction with the game an 8-year-old when some cousins asked him to join them for a scrimmage. The former Fraser High School pupil had won basketball scholarships to Mary Knoll (2012-13) and Kahuku (2014-15) high schools in Hawaii. He then attended Umpqua Community (junior) College in Oregon in the United States in a similar vein in 2015-16.